BEIJING - Double Olympic champion Chen Zhong beat South Korean Han Jin Sun 5-4, adding a second gold medal to host China in women's heavyweight (over 72kg) in the closing game of the taekwondo worlds here on Tuesday. The tournament reached its climax as Chen came up to the platform to realize China's long-awaited expectation of winning the heavyweight at the World Championships. Among the thundering cheers and applauses, Chen brushed aside stiff challenge from Han Jin Sun 5-4 to achieve her first gold medal at World Championships. The two players showcased an splendid game of aggression and attacks. Chen came ahead to score the first two points before ending the first round 3-2. In the second round, Chen made the only effective kick to lead 4-2. Both scored two points in the third round, but Chen was penalized one point, wrapping up the gold 5-4. "It means something special for me to win in Beijing. I could not control my emotion when the national anthem sounds up," said Chen. "I finally won at world championships. Now I proved to everybody that I am capable of winning the world title. "You need to fight at least five games in the afternoon to win the final, but it only takes four games to win in Olympic Games," added Chen. "So I feel World Championships are more challenging than Olympic Games." "Every country can apply to compete here, so you need to face more opponents in order to win. Now I am very confident with the Beijing Olympic Games for I have received help from coaches, teammates and friends." Chen raised the Chinese national flag and saluted the cheering audience all around after the final whistle. Luo Wei, the only other Chinese Olympic champion in taekwondo, was knocked out by Lee In Jong from South Korea 1-3 at the of women's under 72kg on Sunday. Luo's exit pressed the Chinese team no leeway in the heavyweight, so Chen took up the great hope from the crowd. 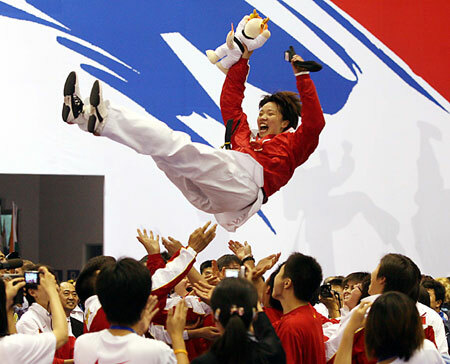 Wu Jingyu won China the first title in women's finweight (47kg) in the opening day.